We love giving back to the community and helping out where we can. Which is why we jumped at the opportunity to collaborate with AV Jennings on their ‘Renee 5’ project. We were among a range of generous builders and suppliers that donated products or expertise to support a well-deserving charity. The aim of the project was to construct a modern four-bedroom, three-bathroom home in the Evergreen community at Spring Farm, NSW. The completed home would then be sold with all proceeds donated to the well-known Australian charity, the Steve Waugh Foundation. The charity helps children and adults with rare diseases by raising funds for medication, treatment, respite camps, specialised equipment and much-needed financial support. 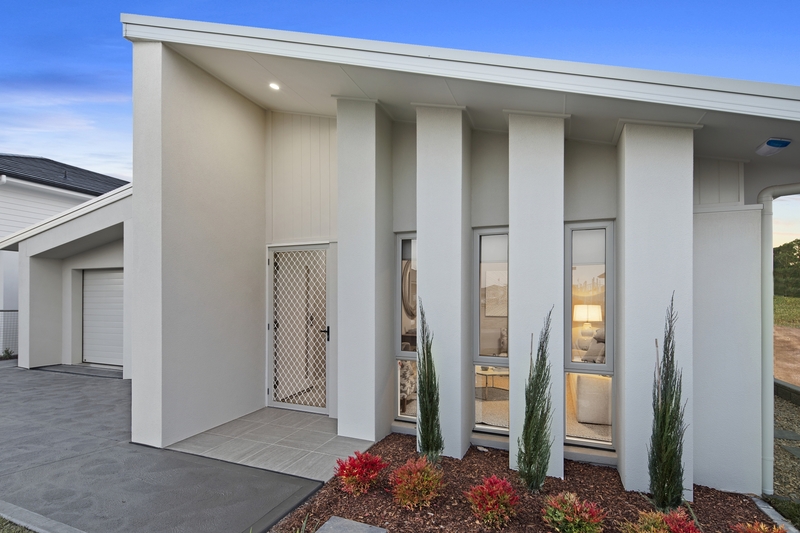 The brand-new home recently went to auction and sold for an impressive $829,000! For the front of the home, we donated the XN1 from the Newington range, with translucent glass. This door was finished in classic white to fit in with the home’s modern look and overall colour scheme. The translucent glass insert allows the home to be filled with natural light, whilst maintaining a degree of privacy. Inside the home, we completed each room with our Pre-Hung Interior H1 Primecoat doors. Due to this product’s easy installation technology, valuable time and man-power was saved during the build. Read more about our pre-hung options here, or watch how easy it is to install. The H1 Primecoat doors from our Honeycomb Flush range helped to create a sleek, modern look throughout the home. We also included suitable pine jambs for these products. Hume Doors also provided skirting and architrave products from our Timber Mouldings range. We selected the Pencil Round Pinetrim – primed profile. The white kept with the home’s light colour scheme and the product gave the home an overall sense of modern elegance. We’re so proud to have been a part of such a worthwhile cause and are happy to see our donations making a difference. To learn more about our community involvement, or if you have any questions about the products we donated, get in touch with our friendly staff today!